A decision on The Midline, a 1.8-million-square-foot development proposed near the Wiehle-Reston East Metro Station was delayed to Oct. 11 by the Fairfax County Planning Commission on Thursday (Sept. 27). JBG Smith, EYA and Chevy Chase Land Co. are partnering to create a 17.5-acre development east of Wiehle Avenue and south of Sunset Hills Road with up to 1.2 million square feet of residential development, 260,000 square feet of office space and up to 250,000 square feet of retail. 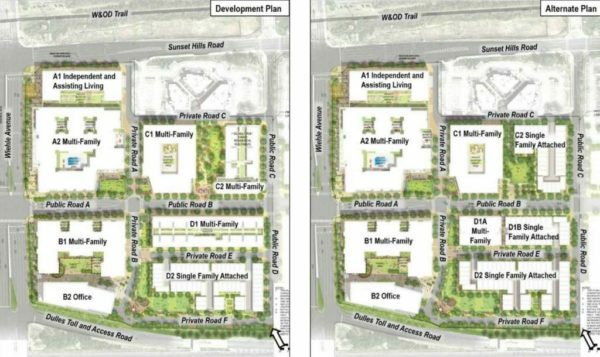 The development team plans to design four blocks and has offered the county two development options. The first would include 1,058 residential units and 251,150 square feet of secondary uses and the second plan would include 1,098 residential units and 187,750 square feet of secondary uses. The case is not yet docketed for the Fairfax County Board of Supervisors.